as it only applies to a few places, with Hong Kong’s overall density only averaging at about 6400 residents per square kilometer. There are about 50 cities in the world that have at least three times that density, among which are such surprises like Paris (3.2 times as dense). Even Macau is 2.8 times as dense as Hong Kong. An not even Manila, which tops the list of most dense cities in the world (6.6 times as dense) is known for it’s high rises. There is no Chinese city in this list, but 18 Indian. It seems unfair to compare these cities to Hong Kong, which by far is not structured like a traditional city and more resembles a small country, with Kowloon as its capital. But this is in a way the point of this story. Hong Kong is so unequally developed, it has everything in abundance, except for living space. The Transportation Department for instance is notorious for using space as if this was Nevada. Exhibit A, the entrance to the Western Tunnel in Sai Ying Pun. Exhibit B, the West Kowloon interchange next to the Yau Ma Tei Taiphoon shelter. Compared to them, the Kwun Tong Bypass or the interchanges in Hung Hom seem like city planning genius, though still not matching 加士居道 Gascoigne Road in Yau Ma Tei (below). Other wastes of space are areas like Kai Tak, where 15 years after the demolition of the old airport there is still a huge undeveloped gap with nothing but a few half-finished public housing estates. Similar situations are found with the West Kowloon ‘Cultural’ District or what is now becoming yet another highway between the Star Ferry Pier and Central. And these are just the examples of places that are already claimed as urban area. Less than 25% of Hong Kong’s territory is developed, and 40% are reserved for country parks and nature reserves. If we were to develop the non-nature reserve area of Hong Kong as dense as Paris, we could comfortably house 14 million people, without needing a lot of high rises either. If we were to build as efficiently as Manhattan, Hong Kong could house 46 million people, and that would, in addition to a 440 km² large country park include public parks about 11 times the size of Central Park. So where does all the fear about immigration come from? Why bar Mainland mothers from giving birth here if all Hong Kong needs is efficient administration (or no administration, as some would say). One part of the problem is, unexpectedly the Hong Kong way of building high rises. With their large distance from each other, the foundation and sometimes only two apartments per floor they come nowhere close to the efficiency of the old Hong Kong Bauhaus-Style apartment blocks. 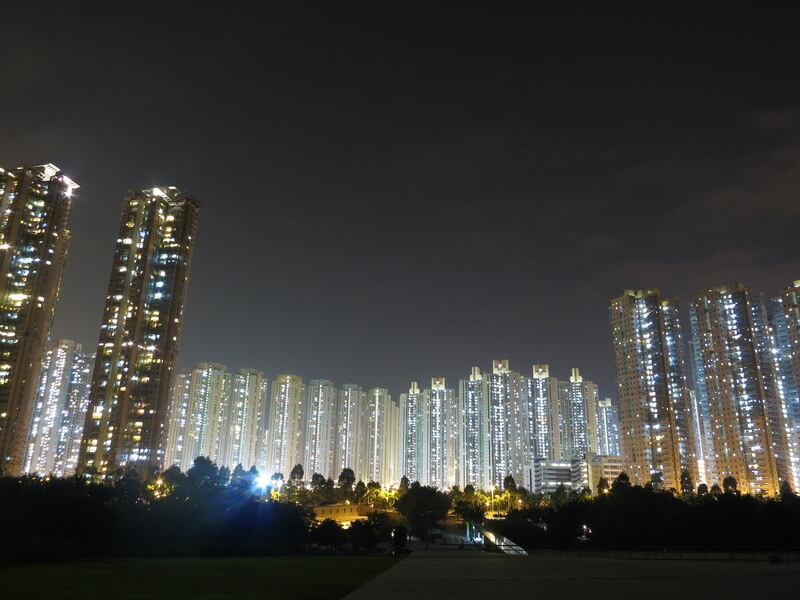 Even Hong Kong’s highest residential building, The Masterpiece only has 345 flats. Much more dense than new high rises. There was a time when highways were built more efficiently than today. Where once an airport was is today still nothing. Maybe one day the Kai Tak runway will become a museum. Why not build here? Plenty of space on the seas.